If YOU have a forum..
For any Bleach Dynasty fans! For any Free Rider 2 Fans! Jack Russle, New Fountain Prizes, Glasses and more - oh my! January has been a great month for all of your Bearville fans, and it is only the forth!!! **NEW GLITCH ALERT: whenever you log in, no mater how many time you have already, you can click the bells in the North Pole (see below) for money! A good way to get insta cash if you don't mind re-loading! Path, Pawforming Arts Center, Neighborhood, Skate Park, and Sunshine Shores!! And thank goodness boys - you will not be going home with another pink scarf - you get a fabulous, cool looking, inflatable dog "balloon" for your home!! North Pole- Make sure you are still going to the North Pole to get your free random amount of money by clicking the bells on the window directly left of Mrs. Clause!! The train will not be taking much longer, so also get in all of your North Pole game playing, as they will not be here much longer!! Glasses- For the many players in Bearville who can't see why your character can't have glasses too, your many requests have been answered!! Now at Pawlettes Botique, under the accessory section, you can choose from three new glasses- the stylish pair, and oval or round thick frame glasses! Also check out the Bear Botique for a new angel outfit!! New Furnishings- Also to adorn your brand new basement and bathroom - both of which i am still saving for - you can now buy the animated washer and dryer set, and a sink where your pet can brush their teeth!! New Fountain Prizes- With the new month comes, you guessed it, new fountain prizes! Now play to try to win: Fedora, Captain, and Black Cat hats, bird, carnation, apricot, ski, and eye chart posters, snow and cozy (slippers) shoes, garnet necklace, wood shipmodel, travel mug, and don't forget a matching slice of Chocolate Cake! Countdown to the New Year!! Well, as i am writing this, there are only about 10 hours and 15 minutes until the new year!!!! I can't wait! Apparently, Bearville has made some resolutions for FUN!! Check out these cool new things! Train- Sadly, soon there will be no more visits to the North Pole, but that is just because Santa is already planning for next year!! But today, if you go for one last visit, click on the same bells from yesterday on the left side of the screen to get random cash again! Hoo-ray! I got 26 bills today! Sunshine Shores Beach- Head to the sunshine shores beach to start your holiday fun!! Click the characters to get cool, red 2009 sunglasses and also a countdown emoticon!! Get ready to party!!! Hello Kitty- Starting January 1, tomarrow, go to the Furbulos Fashion District to see Hello Kitty! She will give you a cool new quest where you can find the bows around town for a prize, alot like Hugs For You Monkey's quest! Jack Russel Terrier- On the second of January, click on the trampoline to the left of the Bear Botique and bounce up to the secret rooftop!! From there, you can talk to JRT and find out a new SECRET way to get a cool new prize!! I can't Wait! Well, I hope you all have a GREAT new year!! See you NEXT year! We hope that you were able to get the hat from Holly yesterday - we are so beary sorry but internet was down here ): If not, you can probabally trade somebody and get it! Today is the last gift - click on the bells on the door, located on the left of the screen, for a random amount of bearbills! I got 99 bills - see what you get! Also, has anyone noticed that they now have music playing for wherever you are... that is new! I heard a story and then a "sing-a-long" one that will be stuck in my head the rest of the week!! Hope your holidays were moo-zzzzzzzz-tastic! 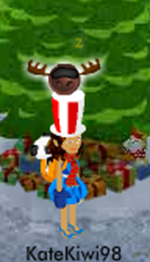 Head up to see Hal moose today to get a nice new emoticon!! It is a sleeping reindeer head - they must get tired too after pulling Santa's sled all night!! 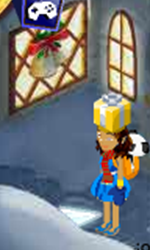 Head up to the North Pole for a last visit, and to get some cool stuff! Then head to Store Fur all seasons and get what Santa forgot! North Pole- Go and see Santa to get a cool lounge chair so you can relax like him for a day! Make sure you get this Today, because today through the 31st they will be handing out different gifts! Also all of the games up North are giving out double prizes!! Earn alot for some sale shopping! Store Fur All Seasons- Make sure you stop in to get all of the clearance items!! The only problem is that there is currently a glitch... everything says 100% off!! Its really not, and usually for the normal price. Come back later though and get your sale items!! It's the second day after Christmas, and even though Santa has just 363 days before the next Christmas, they are still enjoying a well- deserved vacation! When you go and have a chat with Mrs. Clause, she will give you a new treat! A nice, warm, amazing dish of her ultimate blueberry muffins!! Make sure you visit the North Pole every day before the train rides stop!! Christmas time is here, and its happiness and cheer!! I hope you are all enjoying a WONDERFUL Christmas!! What did you find that Santa left you?? Santa got me a directors chair and a video recorder among some cool stuff (may be used for future BB stuff? )Feel free to comment for what you got! Holly- Head to holly for a special candy candy striped hat! Some of our members have brought to our attention that this was on the homepage for a short time last New Year!! Santa- After a nice sleigh ride to all of the homes in the world, Santa has decided to take it easy, and Bearmail YOU a gift!! You get a holiday village, a cute little holiday surprise!! Make sure you get it from Bearmail and all homeowners put it in your house! Well, enjoy all of your new stuff!! Merry Christmas!! We have recieved news that starting January 1st, you can get many new rooms for your house if you have a pet! - BATHROOM - Finally, no more putting the bathtub in a quite public part of your.... bedroom. Also, you will be able to brush your teeth when you buy a SINK for your bathroom!! Just think about how much bad breath and cavities they have fixed! - BASEMENT - A great "anything" or party room!! It will be nice to have a room to put random stuff!! **Remember, you will be able to buy these at the Lumbear Yard!! I hope they will not be too expensive i need to start saving up!! 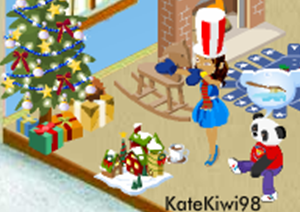 Once Christmas is over, head to Bearville for many new things to begin the New Year! -Sale- At the Store Fur All Seasons, from 26 to 31st, they are having a huge holiday sale!! If you didn't get something, stock up then before it is all gone!! -Cybear-Guides- Start the New Year with lots of cheer! Head To the Headquarters and get information starting on Jan. 1 on helping with DECORATING for a PARTY!!! You may even get a free item!! -Countdown Update- For the New Years Beach Party, they have released new information on what you can get!! You will recieve a cool emoticon and limited edition 2009 party glasses!!! So cool! Wow! There are so many parties!! 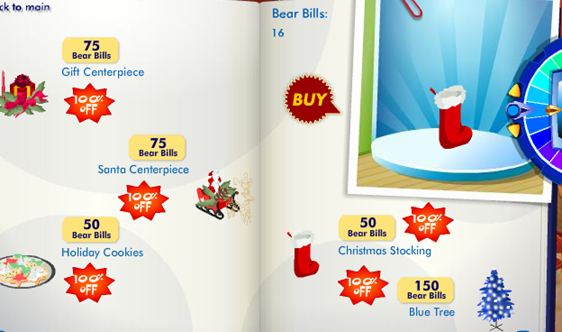 Make sure you check out Bearville A LOT this holiday season! !